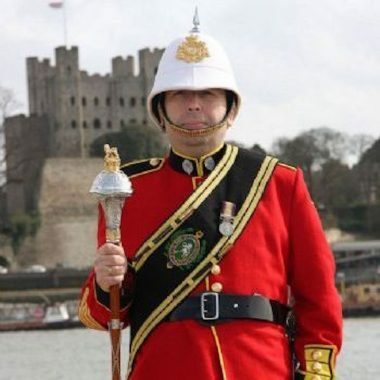 The Band of the 24th Invicta Rifles, hire this traditional British military marching band who offer marching displays & fanfare trumpeters for a variety of in and outdoor events. 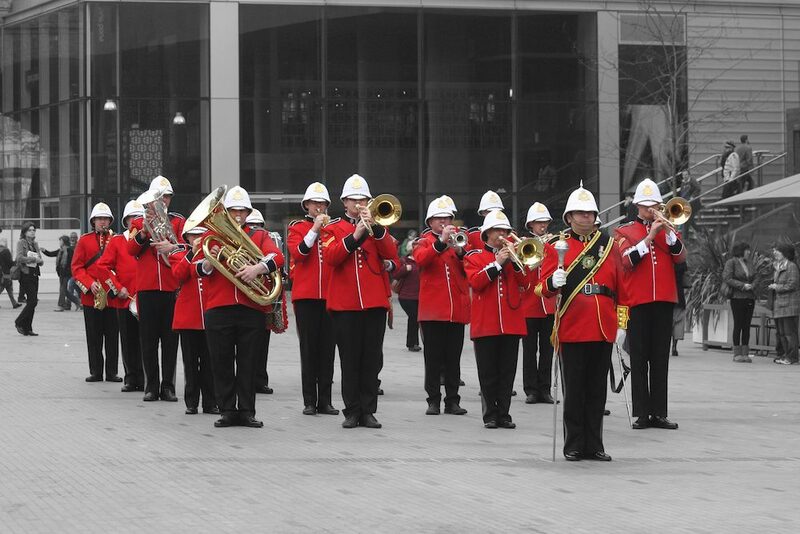 Formed in 2006 the 24th Invicta Rifles Band is the latest addition and a natural progression to Premier Brass who have been working in the entertainments industry for over 12 years and whose owners have served and worked in military music for 20 years now. Consisting of ex-regular and current serving musicians from the military, the band travels throughout the United Kingdom (and are also able to travel abroad) performing for a variety of events from County Shows, arena events, promotional events, street parades, special events such as St. Georges Day, Pass Out parades and town parades to the traditional cabaret marching display (after dinner marching display indoors or out). 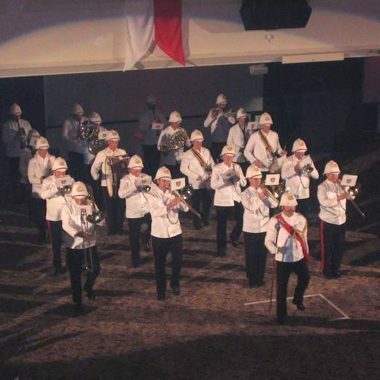 As a traditional military band they can perform on a small dance floor wowing your clients / guests with a marching band display. 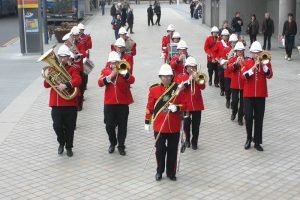 Along with the traditional display, the band forms up for a finale that includes soloists, static music performances and they can also provide “sing-a-longs” for special events. The display then culminates with the traditional asking permission to march off (if applicable) then the march off. Ideal if you are looking for an announcement for the arrival of your guests / dignitaries to your event, announcement of dinner and music as your guests enter, or as an announcement to the beginning of your event. 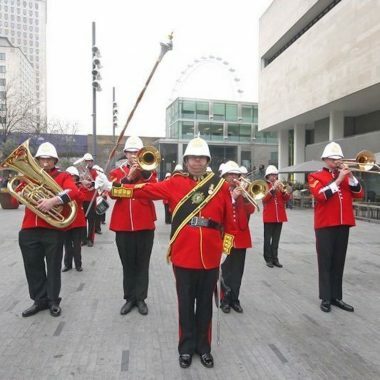 Able to provide anything from one trumpeter to a team of seven with percussion, we can add that ceremonial / triumphal sound to any product launch, dignitary arrival, bridal entry (as at Royal Weddings) or awards ceremony. 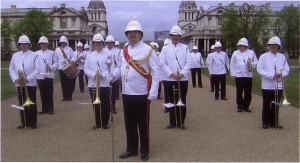 Whether performing on traditional Fanfare Trumpets in military mess dress, as Medieval trumpeters – in costume and on natural trumpets – or in white tie and tails or in any other costume to blend in with your theme (eg Venetian Masked Ball, Christmas party), they can add that triumphal sound to any event. 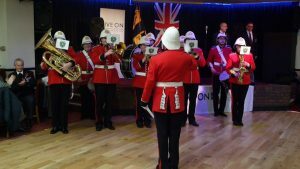 I would like to thank you for organising the band for our Annual Passing Out Parade at Hopwood Hall College and would you please pass on our thanks to the Drum Major and his Band for an excellent display. It really made the parade and we do hope that we can book you again for next year.